This scrollable glossary is just a lightly remediated version of the one in the printed text of Inventing the Medium. Newly added words are marked by **’s. A representational strategy used in computer programming that involves analyzing data and processes so that they may be specified by their most generalized components. The objective of data abstraction and procedural abstraction is to create components that can be reused in the widest possible cases while still maximizing the efficiency of the individual case. A database is an example of data (or information) abstraction. A set of rules for alphabetizing any list in any language is an example of procedural abstraction. Abstraction is sometimes described as “hiding” the extraneous, more specific information. Nested layers of increasingly complex symbolic code. For examples, ASCII code is an abstraction layer that represents letters in the form of 0’s and 1’s; it rests on top of the lower layer of abstraction that represents electrical charges as 0’s and 1’s, and it supports higher levels of abstraction that represent words and programming instructions using ASCII letters. Establishing appropriate abstraction layers in a system is strategy for the design of complex systems. See also Abstraction, Encapsulation, Modularity. The experience of trying out actions in a interactive environment such as a game world, and finding that things act in accordance with your expectations, reinforcing your belief in the virtual world. See also Agency, Interactivity, Immersion. A concept used in the field of human computer interaction to describe the functional properties of objects or environments – the properties that allow particular uses. For example, a blackboard affords writing and erasing, a low, flat, supported surface 30 inches square affords sitting. The term was first used by James J. Gibson (”A Theory of Affordances” 1977 ) to mean the “action possibilities” of a material object in relationship to a potential user, and was adopted by Donald Norman in The Design of Everyday Things where it is defined as “the perceived and actual properties of the thing, primarily those fundamental properties that determine just how the thing could possibly be used.” In the context of this book (as in Chapter 3 of Hamlet on the Holodeck), the digital medium itself is taken to have four affordances or properties that are useful for representation: It is procedural, participatory, encyclopedic, and spatial. In addition, individual platforms have affordances: for example, mobile platforms afford location-specific information services. In computer science, an agent is a piece of computer code that can make decisions and initiate behaviors autonomously (rather than as a centrally controlled subroutine) within a larger computational environment. An agent has goals and preferences and often acts like a human agent, (e.g. a real estate agent, a talent agent) in seeking information or negotiating exchanges on behalf of a actual person. 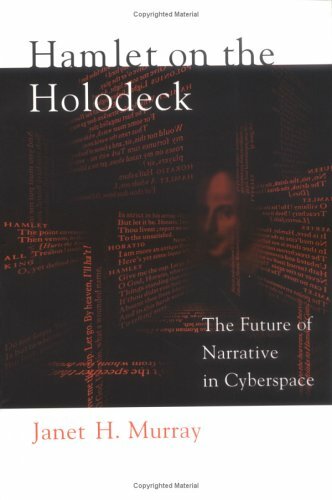 In this book (as in Chapter 4 of Hamlet on the Holodeck), agency is defined as an aesthetic pleasure characteristic of digital environments, which results from the well-formed exploitation of the procedural and participatory properties. When the behavior of the computer is coherent and the results of participation are clear and well motivated, the interactor experiences the pleasure of agency, of making something happen in a dynamically responsive world. The term is meant as a corrective to the inexact use of “interactive” as both a descriptive and an evaluative term. See Dramatic Agency. In computer science, the name given to programming code that, upon execution, mimics life forms in some way, such as becoming self-replicating displaying genetic mutation, or simulating a biological ecology. The classic example of A-life is John Conway’s Game of Life (1970). A well defined set of rules for accomplishing a calculation, search, or other objective of a programming environment. Software engineering involves the use of established algorithms and the development of new ones for more efficient processing of information. Algorithms are abstract methods, separate from the specific computer code in which they are written. Games that take place on multiple real world and digital platforms and simulate events happening in the real world, often involving conspiracy plots, puzzles, and codes that are unraveled by groups of players in loose confederations or organized teams. See also Pervasive Games. Analog forms of representation record information in a continuous stream with analogous qualities to the recorded phenomena. For example, the chemicals in photographic film vary continuously in direct proportion to the light emitted. Analog representation is often differentiated from digital representation, which relies on discrete samples, such as pixels on a screen. A small application that runs on a mobile platform or other specialized device and usually has highly focused functionality, such as a single game, an email program, or weather update. See also Widget. An approach to the design of digital artifacts as networked versions of old appliances (such as a home heating system hooked up to the internet) or in specialized new “information appliances” (such as a dedicated music player). The appliance model reflects a view of computers, articulated in Donald Norman’s The Invisible Computer, as invisibly embedded inside other limited use objects (Norman 1998). Used here to mean any material entity created by a human being on purpose and with some degree of expertise for the purposes of representation, such as a letters carved in stone, a paper shopping list, a portrait done in oils or by photography, a film, an interactive web site. Digital artifact is the broadest term for anything made of bits and processors, e.g. a website, a virtual reality environment, a wireless network, a mobile phone, the Internet as a whole, etc. A specialized field of computer science that attempts to model the processing of the human brain or imitate higher level reasoning in computer code. Also used for characters within games that act as autonomous agents and make decisions based on their situated experience. American Standard Code for Information Interchange, pronounced “ask-key,” associates a binary code (using only 0’s or 1’s) with each letter of the alphabet so that alphabetically encoded information (everything written in letters and words) can be inscribed in computer bits and transmitted across digital networks. First devised in the 1960’s. Derived from the Hindu concept of a god being embodied in different beings. A digital avatar is a character within a virtual world, who represents the interactor or player. Avatars can be specified by gender, appearance, affiliation, personality, and skills using avatar builder programs that allow the user to pick and choose from a substitution system of attributes or to assign points in a resource system. In fictional role-playing games avatars often belong to fanciful “races” like elf, vampire, or Klingon. Having two possible values, as bits in a computer have values that we interpret symbolically as either 0 or 1. Everything that is represented in the digital medium, including the commands it executes, the values it calculates, and the information it stores, is represented within the machine as a group of binary bits, a collection of 0’s and 1’s. A single unit of electrically charged material within a computer. A bit (originally an abbreviation for binary digit) can be in one of two states, symbolically represented as 0 or 1. Bits are arranged in groups of eight known as bytes. A computer system’s internal representation of an image as an array of pixels in which one or more bits represent each pixel. Familiar graphics formats like JPEG are compressed bitmaps. Bitmapped graphics are often opposed to vector graphics, which are stored as a set of instructions for redrawing the image. A convention for describing a process that is a component of a modular software system without specifying how the process works, but indicating what its inputs and outputs are. See also Encapsulation. Any classification system or standardized form or other cultural convention used by multiple distinct communities that would otherwise be separated by conflicting understandings of a shared domain. Defined by Bowker and Star as “those objects that both inhabit several communities of practice and satisfy the information requirements of each of them” (p. 16, 297). For example, a system for classifying the work of nurses may bridge the very different understanding of patient care held by the nursing community of practice and that of the hospital accountants. A common metaphor for the spatial representation of a computer program in which alternate sequences of action diverge (branch off) from common decision points. A group of 8 bits, or the smallest unit of computer memory that can represent a single letter of information. Placing items in categories based on common elements. Differs from classification in that categories may or may not be well-ordered. Derived from the analogy of the channel of a river, a path through which information flows. Channels are used in three related but different ways: 1. In information theory, the channels can be analyzed for the relationship of signal (coherent, intentionally transmitted, meaningful information) to noise (meaningless interference, like static in a radio broadcast). 2. Cognitive scientists often speak of perceptual channels such as vision, hearing, and touch. 3. In common experience, channels are a feature of legacy radio and television transmission — separately administered sources of similar information, often associated with entertainment networks (e.g. NBC, PBS, BBC) that provide the primary means for choosing an information source (tuning to a channel). Each of these uses can be fruitful as a reference point for digital design, but it is important not to confuse them. A data abstraction in object oriented programming for specifying sets of objects that share common structures, in the form of attributes and processes (methods). Members of a class are instances of the underlying pattern. Members of a class can differ from one another because the attributes and processes can be described as containing variables and parameters. For example, one might define a class of monsters and give them the general attribute of height, a variable that can have a specified range of values, and a general method of finding food that can have parameters to specify what kind of food a particular monster prefers and how it goes about harvesting or hunting it. Classes can be nested within one another with child classes inheriting properties from parent classes. For example, a water monster class could inherit size attributes and eating habit methods from the parent monster class, and then add its own attributes and methods, like fins and swimming, appropriate to the water. A classification (or classification scheme) is an ordered system of classes that attempts to account for all the items within large domain, and to differentiate them unambiguously, based on their most important attributes and relationships. Classification schemes often include hierarchies. Examples: the biological classification taxonomy (domain, kingdom, phylum, class, order, genus, species) for living things, the Library of Congress Classification (LCC) system for books. The location of an individual user’s documents, media files, and software applications on a server accessible over a network and available in multiple locations and on multiple devices (and therefore imagined to be in a ubiquitous but non-material cloud) rather than in a single location or on a single person desktop or laptop machine. The user’s access to the data and software is through an account with the company hosting it. A set of symbols – socially fixed patterns — that are associated with experiential phenomena and/ or with another set of symbols. Visual alphabets encode spoken language; Braille and Morse Code represent visual alphabets; computer languages represent instructions that make sense to humans (e.g. “calculate paycheck”) in symbols that make sense to computers (0’s and 1’s). Correspondences between codes, such as the equivalence of a set of dots and dashes to a particular set of letters, can be specified without ambiguity; but the relationship of symbolic codes to the realm of human experience, such as the meaning of words or gestures, is ambiguous, indeterminate, and a matter of interpretation. See also Semiotics. One of the four models of interaction discussed in Section V. Digital artifacts serve as companions to human interactors because we think of anything animated as a social actor (Reeves and Nass 1996),because we can give it behaviors that emulate human actions (such as playing a musical instrument), and because we can engage in imitation games with it, with the computer echoing human actions (as in control of an avatar with a joystick) or with the human imitating the computer (as in dancing and musical performance games). Design goals for the computer as companion include synchronization, politeness, and conversational responsiveness. See also Game, Machine, and Tool Models. A computer is an object or set of objects that changes state in a perceivable way in response to a new set of stimuli, and in accordance with a previously inscribed set of conditional instructions. We currently implement this machine using electronic circuits, but it could conceivably be implemented in other materials. It is not the bits that make a computer, but the behavior – the ability to execute a variable process described in symbolic code. The representation of complexity is an important goal of computation. Computer systems are symbolic representations of processes and entities, and they become more powerful by standardizing components and combining them into larger units. Complexity is built up in computer programming systems through modularity, encapsulation, and nested abstraction layers. In computer programming, an instruction that has multiple outcomes based on the state of a variable. The simplest and most common conditional instruction is in the form: IF X is true, THEN do this, ELSE do something-else. Conditional statements can also specify multiple responses for multiple conditions, or prescribe conditions for continuing or exiting from a repeated sequence of actions. See also Loop. The implied, associated meaning of a semiotic symbol, as distinguished from the denotative and ideological meaning. For example, an American flag may officially denote the nation known as the United States of America, but it may have additional connotations of military service when worn on a elderly man’s lapel pin or of celebration of community when carried by child on the Fourth of July. The constraints on a design project are limitations of any kind, such as time, money, human resources, computational power, bandwidth, and skill. Specific client needs, such as branding or institutional values, can also constrain the range of acceptable design solutions. Platforms of implementation are an important source of constraint. For example, a web project might be constrained in color palette, privacy rights, download time; a mobile application might be constrained by screen size, video formats, attention time. A set of descriptors used in a standardized and consistent manner to ensure precision of reference and retrieval, e.g. street names within a single city, subject categories within the Library of Congress system, and the Getty Thesaurus of Art and Architecture. See also Folksonomy, Namespace, Nomenclature. A common concept in computing for a unit that holds information and has its own name and location. All information systems from ancient baskets and jugs to terabyte hard drives have the concept of a container. Containers usually have labels and nest inside one another, like fields in a record and records in a database or files in folders that are enclosed in other folders. A specialized menu that appears on demand and only when needed, usually in association with a particular object, such as an object in a virtual world or a file in an operating system. Contextual menus have limited options and appear in physical proximity to the object they control. They are usually called up by selecting the object and/or pressing a control key. Also called pop-up menus. Social practices and communication formats shared by members of a culture or subculture, as well as media formats shared by artifacts within the same genre. Conventions routinize and ritualize repeated interactions, providing a familiar way of addressing novel situations or receiving novel information. For example, shaking hands, printing newspaper headlines in larger type, or displaying hyperlinked text on a web page in a different color. Conventions become transparent from familiarity, allowing us to focus on the new information – the particular person we are greeting with a handshake, today’s headlined news, or the destination the linked word is pointing to. Conventions are most often recognized when they are violated in some way, making us aware of our routine expectations, as when someone refuses to shake hands or a boldfaced word on a webpage is not clickable. In digital media, the intersection of genres which were formerly separated by incompatible means of inscription and transmission, such as television and print journalism. Discussions of convergence often focus on the commercial institutions and revenue models that are disrupted by the movement from analog to digital delivery systems, on the erosion of familiar conventions, and on the increased participation of the mass audience as active content producers. See (Jenkins 2006). Central Processing Unit, the part of the computer that does the processing, as opposed to the monitor, keyboard, hard drives, and removable media drives. Before personal computers became available users often shared a single CPU, which was accessed from several individual terminals, and “CPU time” was a valuable resource. Human culture is a system of shared meaning resting on the singularly human practice of symbolic communication. Culture encompasses all the socially transmitted practices, codes, and beliefs shared by the members of a society, including all the media formats, genres, and conventions by which shared attention is focused and meaning is expressed. See Geertz, The Interpretation of Cultures (1973), p. 89. Any collection of symbolic units, often quantitative, collected or presented for the purpose of analysis. Data presented to the computer is most useful when it is structured by semantic segmentation into labeled units. Data is sometimes differentiated from procedures (in programming language) and from information (in information science.) Procedures take data as an input, perform operations upon data, and may also output data in the form of lists or tables. In information science, data is seen as a raw representation of facts or perceptions while information is more meaningful than data because it includes interpretation. An information structure composed of identically structured records, which can be created, modified, and accessed individually, such as an electronic address book. Each record of a database contains segments called fields. The set of all records sharing the same field structure is called a table. Databases structured as a single table are called Flat File Databases; those with multiple interlocking tables are Relational Databases. The complete set of possibilities available when making a decision. The literal level of meaning, the thing most explicitly invoked by a semiotic symbol, like the name of a person, place, or thing, as opposed to the connotative and ideological levels of meaning. An indexing term that describes a media object of some kind and allows it to be accessed, such as the name of an item in a catalog, a search term attached as metadata to a video clip, a bar code printed on a piece of merchandise. See also Metadata, Structured Document, Tags. The process of intentionally shaping a specific artifact or process by choosing among alternate strategies in order to achieve explicit goals. Design is shaped by the specific constraints and affordances of the available resources and by the explicit and implicit needs, desires, and taste preferences of the user group. The adjective used to identify artifacts and processes composed of and performed by computers based on electronic bits. The word “digital” is derived from digit (fingers), and meaning divided into discrete, i.e. separate, parts, like the fingers of a hand. Digital representation is often differentiated from analog representation that records information as a directly varying continuous stream rather than as discretely sampled points. For example, the magnetism of pre-digital audio tape directly varied analogously with (in the same proportions as) the sound waves continuously captured by the microphone. A digital recorder would set individual bits to 0 or 1 at discrete microsecond intervals. The medium that rests on the inscription and transmission of information by electronic bits, and the procedural, participatory, spatial, and encyclopedic. representational affordances of computation. An interface design strategy in which the user is able to affect an object that is either directly present on the screen (such as text in a word processor) or represented through a visual depiction (such as an iconized file folder), with a direct physical action without having to communicate through a mediating command line or menu. For example, clicking and dragging the icon of a file from one iconized folder to another is direct manipulation. The phrase was coined by pioneering HCI researcher Ben Shneiderman (Shneiderman 1992). To resolve ambiguity, by assigning a single meaning where there are multiple possible meanings. For example if there are three authors with the same name a librarian or encyclopedia editor or database creator would provide a separate listing with a unique identifiers for each. A theory of cognition that holds that knowledge and understanding are distributed between our minds and our material artifacts and between an individual mind and larger groups of individuals. For example, our limited individual memory can be augmented by referring to notes on a blackboard, scanning the titles of books on a shelf, or by consulting Google or Wikipedia. Bees in a hive have distributed cognition of where to find nectar and how to make honey, with no single bee knowing the whole process. Media conventions are part of our human system of distributed cognition, making the knowledge of many available to the individual, and shaping our behaviors into coordinated rituals with limited individual coaching. A group of people who communicate in shared genres (such as scientific articles, political blog posts, teenagers’ instant messages). Discourse communities understand one another in part because of their mastery of the media conventions specific to their genres: Teenagers recognize abbreviations and slang, and the appropriate range of responses to a novel but familiar situation, such as a fashion mistake or a sports defeat; scientists recognize specialized vocabularies, and the familiar conventions by which a new experimental finding is presented. The term was coined by sociolinguist Martin Nystrand (1982). The related term Interpretive Communities, was coined by literary critic Stanley Fish (1980), as part of an argument that literary texts are only meaningful in the context of the cultural assumptions of specific groups of readers. The practice of creating a networked resource such as a Wikipedia page or a set of tagged photographs, by coordinating the contributions of creators located in different places and working independently through the use of a common framework. A concept in cognitive science that described the process of knowing things as a collective enterprise, encoded in the built environment, in shared rituals, in other minds, and in media objects. For example, we find our way around an unfamiliar city by way of maps, signage and following other people, building upon a limited amount of first-hand individual knowledge of environment. The design of interactive systems, like the design of physical tools or printed diagrams, is a contribution to the distributed intelligence resources of a society. A media object such as a text, image, or animation. Structured Documents are divided into meaningful segments using metadata tags such as <heading> or <table of contents> . An evolving standard for a unique persistent code that acts like a library call number, an ISBN, and a URL, in identifying and pointing (linking) to a meaningful object on the web with bibliographic precision. DOI’s can refer to fixed information, like the audio version of a published book, or to a container for changing elements, such as a membership list. The contents of a DOI can change over time, while remaining consistently addressable through a unique identifier. The experience of agency within a procedural and participatory environment that makes use of compelling story elements, such as an adventure game or a interactive narrative. To create dramatic agency the designer must create transparent interaction conventions (like clicking on the image of a garment to put it on the player’s avatar) and map them onto actions which suggest rich story possibilities (like donning a magic cloak and suddenly becoming invisible) within clear story stories with dramatically focused episodes (such as, an opportunity to spy on enemy conspirators in a fantasy role playing game). Describes a phenomenon characteristic of complex systems where unforeseen or unforeseeable behaviors arise as the result of the individual actions of multiple agents. Emergent behaviors are sometimes self-organizing. For example, flocking is an emergent behavior of geese, resulting from each goose locating itself with reference to its immediate neighbors but no goose having a goal of creating the emergent chevron shape of the group. Computational systems can exhibit similar emergent behavior, such as A-Life systems.Also used for the unexpected behavior of human beings in virtual environments, such as the use of quest-related game spaces as virtual picnic grounds. An abstraction strategy used in computer programming in which chunks or modules of processing code are embedded in larger systems without having to list all the components of the module. For example the Print module is encapsulated within the Print command that appears on the File menu of an application. The programmers who write the word processor or the photo editor only have to know how to take the user’s input and passing it to the encapsulated Print module as a set of parameters (such as name of the file, size of the paper, margin size, type and location of printer). The commands that go to the printer are hidden from the application programmers, encapsulated within the single Print command. Encapsulation is therefore a crucial strategy of modular programming and a means of building up abstraction layers to create a complex system. With the procedural, participatory, and spatial properties, one of the four defining representational affordances of the digital medium. The digital medium is encyclopedic in three ways: its capacity – the vast number of bits of information it can contain; its extensive range of legacy and computational media formats and genres, including text, moving images, photographs, drawings, animations, musical recordings, audio recordings, live image and sound, three-dimensional models, databases, search engines, videogames; and its ability to represent any process through logical symbolic representation, including simulations of highly complex systems. When the encyclopedic affordance is appropriately exploited, large information resources are semantically segmented at multiple levels of granularity, sorted, classified, and labeled with controlled vocabularies. When informational spaces or virtual worlds are well organized with clear boundaries, consistent navigation, and encyclopedic details that reward exploration they create the experience of immersion. According to the Merriam-Webster dictionary, expression is the effective communication of meaning or feeling. All media of communication are used for expressive purposes and digital media have many potential modes of expression, including the verbal, visual, auditory, and tactile. Expression is a different goal from usefulness, the goal of products of engineering, which are expected to function instrumentally, as tools for accomplishing a task. But even highly useful devices can also function as expressive media, reflecting and reinforcing status relationships and other cultural values. For example, an airplane cockpit can be seen as primarily a set of tools (an “instrument panel”) for accomplishing the task of flying an airplane, but its design is also an expression of the social hierarchy of pilot, co-pilot, cabin crew, and passengers. The same object can be expressive of quantitative scientific data and of more ambiguous qualitative values like social relationships. The design of utilitarian digital devices and the creation of digital works of art and the design of everything in between are all part of the collective effort of expanding the expressive power of the emerging digital medium. An expressive tool allows the user an appropriate degree of choice, inflection, and individual adjustment, supporting the development of expertise, craftsmanship, and technique. An important design value, extensibility is the capacity to add additional functionality or capacity to a finished artifact, such as additional memory added to extension slots in a camera or additional templates added into an extensible folder of a word processor. In programming, extensibility refers to the ability to add new constructs to a language, so the Extensible Markup Language or XML is a framework for elaborating new tagging structures, independent of its predecessor the HyperText Markup Language (HTML). One of several sets of search terms associated with the same item, allowing for search or filtering by multiple attributes or by multiple independent classification systems. Frequently Asked Questions, a useful feature of web sites and other communications of organizations. In interface design, feedback refers to the signal the machine returns to the user as the result of a user action. Ben Shneiderman’s Eight Golden Rules of Interface Design include “Provide Informative Feedback” for every user action, with the most significant feedback for “infrequent, major actions” (Shneiderman 1992). Feedback can be visual (highlighting a selected object), auditory (the clicking sound of a mouse button), haptic (the vibration of a game controller) or verbal (“Windows is shutting down“). In systems theory, feedback is the system mechanism that signals an effect of an action, and sometimes results in a change to the system. The classic example is the change in temperature that provides feedback to a thermostat in a feedback loop that causes the air conditioner or heater to switch off when the desired temperature is reached, and to switch back on when it gets too hot or too cold. In a database, a field is a segment of a record with a fixed length and data type that corresponds to a single semantic unit, like a name, address, or social security number. One of the essential functions for interaction with large data resources, Filtering is done by changing the value of one or more attributes or data fields in a search query or parameterized display in order to remove items from a larger set. If I am searching for movies made by Humphrey Bogart in the American Film Institute online database, I might filter them to include only those made between 1940 and 1955, or only the ones that Lauren Bacall was also in or only those with both attributes. A Finite State Machine (FSM), or Finite State Automaton (FSA) is a way of representing a system of behaviors as a network diagram in which every possible state of the system is represented by a node (usually a circle) and all the possible transition paths that lead from one state to another are drawn as separate lines. The experience of pleasurable absorption in a task that is neither too easy nor too challenging, identified by Mihály Csíkszentmihályi . Flow is characterized by clear goals, a sense of control, clear concentration on an intrinsically pleasurable activity, loss of self-consciousness and a distorted consciousness of time. (Csíkszentmihályi 1990). A diagram made up of boxes and arrows used to describe a computer program or other branching process that makes clear the individual actions and decision points leading to divergent outcomes. Flow charts can be used for the computer’s processing, the interactor’s decision path, or for decision trees that describe conditionalized abstract processes of any kind, such as the question and answer script for a telephone help system. A set of descriptor metadata tags that are created by mass participation without editorial control, Folksonomies are created in shared web resources such an web-based photo archives. They are often shown in overview as tag clouds. See also Controlled Vocabulary, Taxonomy. A standardized aggregation of technical and social conventions governing the inscription and transmission of symbolic patterns so that they form recognizable media artifacts.Formats serve as containers for the creation, transmission, and reception of meaning; Examples of formats: the URL protocols and HTML code that shape web pages; the paper sizes and column arrangements that shape newspapers. Testing that takes place while an interactive project is in development, with collection of results to influence iterative design decisions. In cognitive science, computer programming, and interaction design, a structure, framework, or schema that provides a controlling pattern into which formulaic elements can be fitted. A frame can shape interactions between people (e.g. ordering a meal in a restaurant) or the processing of information in a media artifact (a political news story). Culturally familiar frames allow us to assimilate new events and perceptions into established patterns, sparing us confusion and misunderstanding. When two interactors, or the creator and receiver of a message, do not share the same frame as a context for decoding a message, then they may understand each individual sign but still fail to communicate. For example, a host may rise and a guest may not understand that this is the signal to take one’s leave. Cultural frames, such as ideologies, allow us to interpret complex new events within familiar contexts. Framing a problem is a crucial step in any design process, and often involves reframing from the original presentation to a broader perspective. See also Genres. A document created at the beginning of the design process for a computational artifact indicating what the final product is expected to do. Designers should be careful to question a client’s specifications in order to identify the core underlying requirements and to avoid reproducing inefficient legacy processes. In the ideal design process the creation of the functional specification document will be a collaborative activity, with strong user participation, and will provide the opportunity to collectively rethink the larger context of interaction in the light of the affordances of the digital medium. See also Wireframes. The rule-based, abstract processes and rituals by which games are structured, often involving symbolic game elements, movement around a game space, possession of tokens within the game, turn-taking, and score. For example, rolling dice to move around a game board is a mechanic in many games; jumping over obstacles is a mechanic in platform games. Mechanics can be thought of as composed of physical and logical components: one can change the dice to a spinner in the boardgame or change the input device from a game controller to a keyboard in the platform game while retaining the logical structure of the underlying mechanics. Mechanics can also map symbols to the actions they represent, such as identifying a roll of the dice in Dungeons and Dragons with the performance of a spell in the game world. One of the four models of human-computer interactivity discussed in Section V. Games are an ancient genre of representation that focuses our playful shared attention on synchronized, pleasurable rule-based systems of interaction. Digital artifacts elicit playful behavior and shape interaction into similarly rule-based systems of shared attention that resemble games. Design goals for the computer as game include convening synchronized participants through shared rituals and encouraging kaleidoscopic playfulness. A field of study in mathematics concerned with calculating outcomes of game-like situations that has been applied to the study of strategic decision-making in social science, political science, and economics. Game theory produces simulations that are usually based on the assumption that human beings are rational actors trying to maximize their advantages in unpredictable situations. A term of categorization within literary and communication studies, referring to representational artifacts that are characterized by similar conventions and formulas. Genres can have subgenres (e.g. the novel and the detective novel) and can be media-specific within a single medium such as print (news article, feature article), film (buddy movie, gross-out teen movie), television (sitcom, hospital show). Genres also exist across media (detective story, exposé, romance, allegory, tragedy). “Genre fiction” is a term that refers to stories that have more exaggerated genre formulas such as horror films, medieval fantasies, murder mysteries, science fiction. Genres serve as frames for understanding a new media artifact as a member of a familiar group with predictable conventions. The advantage of writing or designing within recognizable genres is that the audience can form expectations of what is likely to happen based upon familiarity with the conventions. Interactive role playing games are often based on genre fiction conventions, starting with the popular Dungeons and Dragons games based loosely on Tolkien’s fiction. Digital genres and sub-genres include: videogame, first person shooter game, simulation game; web site, university web page, newspaper site, political blog, online store. See also Conventions. The term refers to the slope of the learning curve, which takes the learner from novice to expert. If it is too steep then learners become discouraged. A gentle slope system introduces new material in small increments. Garbage In Garbage Out, a proverbial expression in computer programming, a corrective to the false authority often attributed to computer-generated information, and a reminder that you cannot make reliable calculations on the basis of false or sloppy input data. A global variable in a computer software system is accessible to every module in the system, as opposed to a local variable that is only seen and acted upon by a single module. A form of visual organization of intersecting horizontal and vertical lines based on the table, one of the earliest forms of information design. A pejorative term for boring, repetitive gameplay that is necessary for the achievement of a game goal. Building a character in an online role playing game often requires hours of grinding to increase skill levels. Graphical User Interface, a combination of computer display and input devices that provides the interactor with an abstract or concrete representation of the system as the basis of interaction with the machine. For example, the familiar WIMP desktop environment. Referring to touch, and to the interface devices that address the sense of touch through pressure and vibration. A generally reliable but imprecise procedure for accomplishing a task, such as using the proverbial “rule of thumb” instead of a precisely calibrated ruler for making approximate but good enough measurements. Hexadecimal functions as a kind of shorthand for binary representations, allowing humans to read it more easily and using only two digits to represent 8 binary bits. A system of organization in which some elements are subsumed by others within a multi-tier structure, for example a computer file system in which files are contained in folders and folders are nested inside one inside the other; a library classification system of categories and sub-categories; or the chain of command of a military organization from commander to generals to privates. In creating a hierarchical organization it is important that items at the same level of the hierarchy be appropriately similar to one another. HyperText Markup Language, invented by Tim Berners-Lee as the basis for the World Wide Web, and made public in 1991. It is based on the international standard SGML (Standardized Generalized Markup Language), which was originally developed for the representation of print documents in electronic form. HTML created a notation forhypertext that has become the global standard, and provided the basis for the standardized linking and display of documents independent of the platform, operating system, and application in which they were created. See also XML. A visual sign in which an image is used to represent a digital object or action through its resemblance to a highly salient, characteristic, recognizable aspect of the thing it signifies. Since digital actions are often quite different from those in the physical world, icons often refer to analogous physical actions, such as using an image of a scissors to represent deletion of part of a document. A set of ideas and beliefs, held consciously or unconsciously, and often associated with an ideal of social organization or with the program of a particular political faction or cultural tradition. Ideological assumptions provide an important interpretative frame in which meaning is transmitted or inferred, and it is often the controlling frame in whichdenotative and connotative meanings are assessed. For example, ideological beliefs about the nature and appropriate social role of women may shape the way in which female avatars are constructed in virtually worlds. Other areas of contested ideological assumptions include political systems, economic systems, stereotypes of nationality, gender, race, age, and occupation, sexual morality, religious doctrines, nationalism, pacifism, vegetarianism, secularism, etc. There is no way to make completely neutral cultural choices, sincewe are all products of particular cultures and tolerance is itself an ideology. Nonetheless, designers have a responsibility to be mindful of the effects of ideological assumptions upon design choices, to be explicit about choices that are ideologically driven, and to avoid design choices that intentionally or inadvertently reinforce questionable beliefs and values. Immersion is an experience of the interactor, a sense of being contained within a space or state of mind that is separate from ordinary experience, more focused and absorbing, and requiring different assumptions and actions (like swimming when immersed in water). Immersive experiences are disrupted by inconsistency and incompleteness of the environment, and reinforced by encyclopedic detail and a sense of vast spaces within clearly marked boundaries. Immersion is further reinforced in digital environments by theactive creation of belief , by which the interactor is cued to explore and to take actions within the immersive world and is rewarded for the actions with appropriate responses. Immersion and interactivity are characteristic pleasures of digital environments. See also agency. Information is data that has been organized, contextualized, and interpreted. Information Designers and Information Architects create organizational structures to store, retrieve, and present information as clearly as possible, mastering complexity through the use of appropriate conventions of format and representation. In digital media the most common objects of information design are databases, archives, and media-rich websites. A branch of research and engineering practice at the intersection of electrical engineering and mathematics. Information Theory is based on the transmission model of communication elaborated by Claude Shannon and Warren Weaver which sees all exchanges of meaning between animals, people and/or machines, as the transmission of amessage from point A where the sender encodes it, through a channel that maximizes signal and minimizes noise, to point B where the signal is decoded by the receiver into the original message (Shannon and Weaver 1963). In object-oriented programming, a class, or generalized description of an object, can inherit attributes and methods (processes) from a parent class of which it is a subcategory. For example, the class of toasters could inherit the attribute of electrical switches from the parent class of appliances. The data that is fed into a computer-based procedure. See also Output. Inscription is the intentional shaping of a receptive physical material with an appropriate technology so that it produces a perceptible result. Inscription requires an intentional agent, a markable material, .an appropriate technology, and a perceptible result. Inscription, transmission, and representation are the three functions of a medium. See also Convention, Format, Genre. In computational systems computer code describes entities as generalized cases that are realized in run-time as specific instances or instantiations. The word “instantiation” can also be sued to refer to the process of creating specific instances from abstract representations. Although one can speak of the instantiation of any generalized procedural object, such as a vector graphic or a videogame, it is most often used in the context of object-oriented programming, where it refers to a specific run-time versions of a general class of computational objects. Instantiation is an important representational strategy characteristic of the digital medium, derived from its procedural and encyclopedic affordances. See also Abstraction. A goal of informational systems, to provide access to material held in a collection based on the meaning of the content. For example, finding a book through the subject catalog provides intellectual access, whereas finding it by its ISBN does not. An instance of related behavior between two entities that are acting upon one another usually through a common medium or some shared or transferred artifact; for example: a spoken conversation, a telephone call, a purchase in a store, a street fight. The parties to an interaction can be living things (like human beings or plants in pond ecology) or mechanical devices (like vending machines or computers) or dynamic elements in a complex emergent social system such as mortgage rates, bank capital, and regulation constraints within the global economy. In digital media, human actions and computer responses are shaped into discrete interactions, which, if well-formed, elicit the experience ofagency in the interactor. Digital environments can also represent complex systems of interaction in simulations. A design term that is often used too loosely, and is sometimes confused with mere activity or potential actions. Composed of three separate entities: the procedural andparticipatory affordances of the digital medium, and the associated aesthetic pleasure of agency that results when the interactor is appropriately scripted to perform actions that the computer code can respond to appropriately. See also Immersion. The human being who is interacting with a digital artifact. Preferable to “user” because the artifact is not necessarily a tool. An emerging discipline that structures people’s relationship to artifacts and systems, especially but not only those that make use of the affordances of the digital medium. Interaction designers emphasize the fit between human actions and system responses. Generally used to indicate the perceptible parts of a computer program that stands between the code and the user. A useful term, though misleading as the focus of digital design since interaction design is more inclusive and has supplanted it as a description of professional practice. An often misused term applied as a design value for digital environments. A truly “intuitive interface” draws on tacit knowledge and well-established conventions to cue the behavior of the interactor to act appropriately in a new environment without explicit direction. For example, if we approach a mysterious new gizmo and it has a big red button in the middle of it, we will “intuitively” try to press it. The system of transmitting computer-coded electronic signals around the globe through a distributed network formed by connecting millions of smaller networks, using standardized formats and protocols, and composed of computers, electrical wires, fiber optic cables, and radio waves. A necessity for interactive projects whose hidden user requirements, programming glitches, and interaction design flaws only become apparent as the design is realized as use case, functional specification, mockup, storyboard, prototype, and working modules. Iterative design is dependent upon formative evaluation with users outside the development team, whose supervised sessions provide feedback on what is working and what needs to be modified. In relational databases, the technical term for a table that unites fields from two other tables. Also the name of a database search command that seeks information from multiple tables. Social interactions between a young baby and a caregiver in which they are both paying attention to the same thing, and they are also both aware of the experience of shared attention. Joint attention is a starting point for the acquisition of language (Donald 1991; Donald 2001; Tomasello 2001). One of the building blocks of information organization, a form of metadata that identifies or describes the object that it is attached to. Labels are often associated with containers. Media whose conventions and formats predate the digital revolution, such as print, television, still photography, telephony. The term derives from information architecture, which is frequently concerned with building new systems while making provision for the archiving and retrieval of existing data stored in older systems and formats, referred to as legacy data. Examples of legacy formats: vinyl record albums, paper-based books, half-hour television programs. Examples of legacy conventions: holiday music albums, page numbers in books, television commercial breaks. Designers should draw upon but not blindly reproduce legacy media formats and conventions in digital environments. Instead they should ask what purpose the conventions served in their original context, and if the underlying purpose is still valid (e.g. providing advertising revenue), they should determine how best to serve it using the affordances of digital media. Having a single sequence from beginning to end, as in a straight line. Used of legacy media such as books and films, and sometimes used pejoratively of unisequential digital artifacts. Hypertext and experimental digital art is often described as non-linear. It is problematic, however, to design for a negative quality, so non-linear is not helpful as a design term. See also Multiform and Multisequential. The building block of hypertext. The link came into most active use with the popularity of the World Wide Web in the late 1990’s, but was explored earlier starting the proposals and demonstrations of Douglas Engelbart , Alan Kay (at Xerox PARC), and Ted Nelson; the Movie Manual of the Architecture Machine Group (the pre-cursor to MIT’s Media Lab); Brown University’s Hypermedia project; the University of Virginia’s StorySpace Project later published by Eastgate Systems; Apple Computer’s HyperCard; the independent commercial project SuperCard; IBM’s Guide. One of the earliest forms of information organization, common to oral (memorized, recited) media and early writing. As writing developed, lists could be expanded and spatializedinto tables. One of the signs of an immature medium or a disordered domain is a reliance on overlong lists, rather than tables and hierarchies. A foundational programming structure in which a set of instructions is executed repeatedly until an exit condition is met. Infinite loops – programming sequences that repeat forever, or until the process is terminated or the computer crashes – are a common cause of program failure. One of the four models of interactivity discussed in Section V. A machine is any manufactured device that augments human effort, performing its automated task with minimal human intervention. Design goals for the computer as machine include maximizing human control, and making the hidden processing visible to the interactor. See also theCompanion, Game, and Tool Models of interactivity. <h1>Markup for Level One Heading </h1>. XML is a more abstract markup language that can be used for defining other markup languages. Any combination of materials and cultural practices that is used to support intentional, meaningful communication by affording inscription, transmission, and representation. A unit of computer memory, equivalent to one million bytes (roughly one million letters) or eight million bits (eight million 0’s or 1’s). A fundamental strategy of human cognition, by which we understand one thing by mapping it onto something else, usually something drawn from concrete physical experience(Lakoff and Johnson 1980). Metaphors are also a strategy of interface design, most notably in the desktop metaphor by which files, folders, trash cans, and (in a separate, inconsistent metaphor) windows are visual representations of abstract entities within the machine. Metaphors can help us to form useful mental models of a digital environment, but they are also potentially misleading since digital processes often diverge from physical processes, and if taken too far can introduce unnecessary effort. For example, in the notorious Microsoft Bob system, applications were placed in separate graphically represented “rooms,” distracting users from the task at hand by asking them to create a spatial mental model and to navigate through unnecessary virtual places. In object-oriented systems, a named, separately executed procedure that is associated with a particular object. For example, an Employee object might have a method calledcalculateHours associated with it. A system of small payments, advocated by Ted Nelson and others, that would compensate copyright holders for digital documents excerpted or reproduced by others in a network. See also Transclusion. A rapidly produced rough approximation of a product, often a non-interactive digital image of an interactive environment. Mockups are useful for communicating design ideas, for comparing alternate approaches, and for guiding development. They can be used for paper-based testing or hardwired to simulate the processing of the final system in a particularuse case, to serve some of the same purposes as a truly functional prototype. See also Iterative Design Process, Storyboard, Wireframes. A desirable attribute of software systems that entails decomposing a larger program into smaller, coherent units with clearly defined protocols for interactions between the separate modules. Modularity is a key strategy of abstraction, foundational to the design of complex systems. The observation, prediction, and development goal articulated by Intel Corporation co-founder Gordon Moore in 1965 that the capacity and speed of computer processing chips doubles every 18 months to two years, a continuing trend which has made computational devices exponentially more powerful, and therefore ever smaller, lighter, and cheaper over the past four decades. As a result, it has been safe for designers to assume that processes that are too slow today will be widely available at satisfactory speeds at some point in the future. Having more than one configuration based on the same general components or framework. Games are often based on multiform scenarios, dynamically generating variant instances of a character type, place, or event, from an underlying procedural abstraction, or assembling variant combinations from a substitution system. Composed of media objects in multiple formats, corresponding to legacy media types, such as video and text in a single document. A multisequential story or a multisequential information space is one in which there is more than one valid, coherent path through a set of segments. The distinction betweenmultisequential and unisequential is more helpful for design choices than linear/non-linear, since multisequentiality is more specific, connoting coherence and greater complexity, while non-linearity is less specific and negative. To assume that social or representational conventions are natural rather than the result of historical and cultural forces; to take familiar behaviors, artifacts, or design features for granted without noticing their origins. Naturalizing is an effect of ideology and power structures; for example, the powerlessness of women in 19th century English was taken for granted as a part of nature until challenged by feminists. Naturalizing is also an effect of habit; for example, by the end of the 20th century people took the telephone for granted as an ordinary part of life, only noticeable by its absence. By the early 21st century, the cell phone had become similarly unremarkable. Naturalizing is a useful concept for calling our attention to what we notice and what we don’t notice in social structures and the design of artifacts. Sets of related names within a nomenclature that are used consistently to identify and differential sets of objects, such as names of vegetables applied to a group of computer servers, or a names of trees applied to roads in a subdivision. In a spatialized information structure, like a web site, a menu bar that remains in the same physical place, like the top or left side of a web page, to give access to all the distinctly labeled areas within the space. Navigation bars should also give intellectual access to the contents of the space, providing an overview of what is to be found on a website in the same way that a Table of Contents presents an overview to a book. A set of nodes connected to one another, often drawn as circles connected by arcing lines or directional arrows. Networks are often offered as a form of information design andsocial organization that is more democratic than hierarchical branching trees (although a branching tree is in fact a particular kind of directional network). But networks can also reinforce existing power structures and privilege some nodes over others. A vague term that refers to the new formats and genres created by the introduction of computer processing into communication in the last half of the 20th century. This book argues for thinking about digital artifacts as comprising a single new digital medium. A meaningful unit, connected to other meaningful units within a network. In spatial design, such as urban planning, the area around a metro station or a shopping district can be thought of as a node, connected to other activity areas by paths. In information theory, the disruptive, meaningless, or extraneous part of a meaningful transmission, like static in a radio broadcast, as opposed to the meaningful signal. Any system of names that is socially agreed upon, such as the Latin names for parts of plants, the days of the week and the months of the year, or roads of the U.S. highway system. Nomenclatures are made up of one or more namespaces. Objects are high level programming concepts that combine data and procedures (methods). Objects are defined as classes, generalized clusters of attributes and behaviors; a specific object is an instance (or instantiation) of the class patterns, with its own variation. For example, if an object FLOWER has the attribute COLOR with several possible values, a single instance of the class might be a YELLOW FLOWER or a RED FLOWER. A programming structure and set of practices that is afforded by a number of languages, beginning with Alan Kay’s SmallTalk (1974) and most commonly associated with C++ and Java. OOP is characterized by an abstraction hierarchy in which elements of the system, called objects, are specified as members of classes with shared characteristics. Objects combine data structures and related processes or methods. The methods are often written as event-handlers, to be triggered by an interaction initiated by a human interactor, another object, or another computational process. In philosophy, a definition and specification of the essence of an entity, as in the statement that God is Love, or matter is composed of irreducible atoms. In computer programming, an ontology is an explicit formal specification of the objects, concepts and other entities that are assumed to exist in some area of interest and the relationships that hold among them, as in an ontology of human diseases and treatments. The data that is produced by a computer program and passed on to other processes and sometimes to the interactor. See also Input. A variable whose value changes the way a programming function is calculated or an object is instantiated. For example, a program function may be written as GetPrice (item, color, quantity). A program may call this function by specifying the parameters like this: GetPrice(blouse, red, 3) causing the program to return the price of three red blouses. The variables that specify the attributes of instances of a class are also parameters, as when we instantiate the class defined as flower(color) with the statement new flower(red). With the encyclopedic, procedural, and spatial properties, one of the four defining representational affordances of the digital medium. The digital medium is participatory in allowing an interactor to manipulate, contribute to, and have an effect upon digital content and computer processing. Participation combined with procedurality create interactivity, which means that the designer must script the behavior of the computer and the behavior of the interactor. When participation has been well-shaped the interface becomes transparent. Transparent participation combined with visible procedurality creates the experience of agency for the interactor, a key design goal for any digital artifact. The participatory affordance can support but should not be confused with social participation in online communities and the participatory design practices that foster extensive user involvement in the development process. A recognizable configuration especially those that can be perceived and recognized by sight or sound. Cognitive patterns, called schema, provide frames for assimilating new experiences to known configurations. Media conventions are patterns that fit together into formats and genres, allowing us to convey the meaning of a novel communication by shaping it into a familiar configuration. A handheld digital device that includes a calendar and address book, such as the Apple Newton or the Palm Pilot. The PDA was a popular category of consumer device in the 1990’s whose functions were absorbed and expanded by digital cell phones (popularized as “smartphones”) in the early 2000’s. Games that take place in real world locations or that use informational computer technologies like email or social networks for gaming purposes while blurring the boundary between the everyday world and the game. See also Alternate Reality Games. A memorable, differentiated area within a navigable space. Designing navigable digital environments requires the creation of distinct places through consistent labels, visual cues, and especially through association with memorable events. See also Active Creation of Belief, Immersion, Spatial Affordance. Fixed configuration of inscription materials and transmission codes, of hardware and software, that forms a foundation for multiple media artifacts. Examples of stable digital platforms: an operating system like MS DOS, Windows, Mac OS X; a game console like Nintendo Wii, Microsoft X Box, Sony Playstation; a browser like Explorer, Firefox, Chrome; a DVD format like Blu Ray. Platforms have affordances and constraints. The existence of a stable platform encourages the growth of standardized formats linked to conventions of representation leading to the development of genres. For example, the popularity and stability of the iPhone platform has led to the development of several genres of phone applications, in the common format of an iPhone “app.” Once developed, genres can become independent of their incubating platform though they may still retain features that reflect the affordances and constraints of the originating environment. Completion that pops up automatically in response to partially entered text. Predictive text relieves the burden of repetitive typing on awkward mobile devices and provides search engines with the ability to steer queries to known areas. Interactors are usually given a choice of accepting or rejecting the completion text which may appear in line as if typed by the interactor or in a separate line for confirmation. The smallest units in a processing system, with which the more complex units can be built. The 00’s and 11’s of machine code are the lowest level primitives of programming languages. The representations of alphanumeric characters and other data types sit on top of these representational primitives, as do the operations of the computer. On top of these patterns of 00’s and 11’s are built the higher level primitives of assembler language such as ADD and GOTO Structured languages have more complex primitives such as IF THEN and CASE statements, and are translated by special programs called compilers into the primitives of machine code that allows the computer to execute them. It is a principle of good programming to establish primitives and build complexity from efficiently designed simpler elements. Similarly, designers can think of participatory actions, like pointing and clicking, as primitives of interaction, and interface elements like menus and buttons as primitives of visual interaction design. In programming, procedures are sets of instructions that the machine will execute. Functions and methods are procedures, and the word is sometimes used to distinguish the instruction part of a software environment from the data. The most important of the four affordances of the digital medium, the processing power of the computer that allows us to specify conditional, executable instructions. The procedural affordance has created a new representational strategy, as powerful as spoken language or recorded moving images: the simulation of real and hypothetical worlds as complex systems of parameterized objects and behaviors. When procedurality is well designed the actions of the computer have visibility, and the parameters in the control of the interactor. Procedurality and participation are the affordances that create interactivity and visible procedurality combined with transparent participation creates the experience of agency for the interactor, a key design goal for any digital artifact. Not to be confused with the use of the word “procedural” to describe the more linear programming strategies that predate object oriented programming. See also interactivity, agency, and the participatory, spatial, and encyclopedic affordances. A convention for providing feedback to interactors on an otherwise invisible automated process, like downloading a file, that requires waiting. For example the familiar progress bar represents the task as a line moving left to right filling up a space in proportion the degree of completion. Progress indicators often have explicit calculations of time left to wait, and are associated with a cancel button allowing the interactor to quit out of a too slow process. A formal standard specification for exchanging communication in systems of people, machines, or both combined. Diplomatic protocol is a code of conduct that specifies how ambassadors and heads of state are greeted and seated at international functions in order to ensure that no one will be confused, misunderstood, or offended. Internet Protocol (IP) is a suite of standard formats and processes for transferring information across machines and transmission technologies. A strategy of classification for ambiguous sets of artifacts, established experimentally by Eleanor Rosch, based on identifying representative exemplars and shared attributes, such as “chair “and “sofa” as exemplars of the category “furniture” (Rosch 1975). A cognitive model that can be employed as a alternative design strategy to (or a way of eliciting the necessary distinctions for) fixed definitions and hierarchical taxonomies. An interface convention defined in the Macintosh Human Interface Guidelines, as one of a set of buttons in which only one can be chosen at any time. Radio buttons are round, and the chosen one is marked by a dot in the middle. Radio buttons are differentiated from sets of check boxes, which are square, and which afford multiple simultaneous marked (checked) choices. A concept in cognitive science referring to the reconceptualizing of information in order to make it more memorable, especially the chunking of smaller items into larger conceptual units, such as the breaking down of a long string of numbers into multiple smaller units. An entry in a database representing a single item, made up of discrete fields. An important part of the process of creating new media genres is the refining of existing media conventions. For example, as part of the process of re-inventing television news, designers refined the headline scroll so that it moves vertically instead of horizontally, assuring that viewers always see a complete headline. The phenomenon of reproducing the conventions and/or content of one medium in another medium. Also the theory, advanced by Jay Bolter and Richard Grusin, that “new media” always reconfigure older media, and in particular that digital forms both borrow from and seek to suppress earlier forms. (Bolter and Grusin 1999). The process or effect of creating meaning by connecting signs (e.g. the set of vocalizations pronounced “tree”, the written word “tree,” a sketch of a trunk and branches) with referents in the world (a particular tree) or abstract concepts (the general category of “tree”). Representation is supported by socially constructed codes, and meaning is created within specific cultural communities of interpretation, such as French courtiers of the 17th century or contemporary American urban teenagers. Representational codes are sometimes distinguished sometimes from presentational codes which involve immediate bodily presence (e.g. gestures, clothing) rather than mediated communication such as writing. In acting, “representation” refers to a detached style rejected by 20th century theorist/teachers like Stanislavsky and Strasberg in favor of “embodying” the character. See also Medium, Semiotics. A kind of game mechanic in which a player is given a limited quantity of some resource (money, weapons, land, avatar-building skill points) to distribute among a range of desirable choices. Resource allocation games (e.g. Civilization, Sim City, The Sims) force players to think strategically. The mechanic is applicable not just to games but to simulations in general, and to the avatar building phase of games in many genres. The generation of a new instance of an object or character in a simulated world or game. The Pac-Man ghosts respawn after dying, as does Pac-Man himself until he has used up all his lives. Usually respawning happens at a designated place in a game world, often setting the player back to an earlier stage. Standardized patterns of interaction that are performed in a predictable, prescribed, or spontaneously elaborated but consistently repeated manner among members of a culture. Rituals may be written down and repeated verbatim (as in religious and legal ceremonies) or they may provide a general framework for interaction (like greeting guests at an informal party). Rituals often assign different roles to the participants, such as the bride, groom, minister, ring-bearer, etc. at wedding. Familiar rituals organize social life for large scale events (like elections) and repeated events (like leave-taking). Interaction design can be thought of as the creation of appropriate rituals for coordinating human-computer interactions and human-human interactions mediated by computer. A desirable quality in computer systems, indicating reliability and flexibility, especially the ability to recover from error-inducing conditions such as poorly formed input or other conditions that the developers could not explicitly foresee. Modularity supports robustness by allowing programmers to isolate elements that can lead to program failure, such as hardware-specific drivers that will need to be updated separately from the rest of the system. See also Modularity, Scalability. An area in a complex computer system or game where interactors can practice with the tools and commands at their disposal without consequences in the main system. Also used to describe games or environments that allow the player to construct their own virtual objects such as Spore Galaxies or Second Life. A place or level in a game at which the player is allowed to save the current state to be returned to on replay if they reach a losing state – usually the player’s character dying or failing irreversibly at a task – before reaching the end of the end. Some save points, like the start of a new level, are automatic, and some require the player to issue an explicit game saving command. Platform games like Super Mario will automatically respawn a new instance of a character at save points. A desirable quality in computer systems, indicating an ability to accommodate more users, larger data sets, and other increases in the scale of processing without crashing or having to be re-engineered. Scalability is also a useful concept for human systems, which often work at the small scale level, like the accounting system in a family-run pizza parlor, but do not “scale” appropriately to accommodate a larger enterprise, like a chain of pizza parlors. See also Robustness. A story-like abstraction of a dramatic situation that focuses key elements of a design problem, as in a use case, or of a replayable simulated process, as in a military training system. See also Storyboard. An organized, abstract representation of knowledge, pluralized as schemas or schemata. The term can be used to refer to mental constructs (cognitive schemas representing, for example, our general concept of a house, a newspaper, or the grammatical structures of a language), classification schema (like Dewey Decimal system), or computational objects (e.g. XML schemas for standardized documents, components of computational knowledge representations). See also Frame, Pattern, Taxonomy. Dividing of information into its constituent units. Segmentation is one of the key tasks of information design. The granularity with which information is segmented is always an important design decision, with the goal of creating semantic units that provide both precision of reference and preserves the context of the larger unit. Legacy segmentation conventions often reflect the constraints of pre-digital materials, such as the paper page or the vinyl record album. A unit of information in which a single physical form is associated with a logical division in meaning. A paragraph is a semantic unit, but a page is a physical segment that may or may not correspond to a meaningful content division. Other examples of semantic units are: a spoken or written word, a sentence, a chapter, a database field or table, a shot in a movie, a single photograph, a sequence of shots or photographs detailing a unified action. Semantic units may overlap one another or be nested one inside the other. In representing information in digital form it is important to segment it into semantic units of multiple levels of granularity for indexing and display. A goal articulated by Tim Berners-Lee and pursued by the World Wide Web Consortium (W3C) for integrating vast distributed knowledge resources through common information structures such as permanent addresses and XML document schemas (Berners-Lee, Hendler et al. 2001; Berners-Lee, Shadbolt et al. 2006). The study of signs, such as language, gestures, and written or graphical texts for the purpose of understanding what they mean and how that meaning is constructed within specific cultural contexts. Important theorists of semiotics include Ferdinand de Saussure, A.J. Greimas, Roland Barthes, and Umberto Eco. The cognitive process of constructing a mental model of a confusing or complex entity or experience, as well as the social, cultural, and institutional processes and the information design strategies that support the collective creation of such models. The basis of all communication. Media conventions and genres create shared attention by establishing common formats, expectations, and semantic associations. To invent a new medium is to expand the human capacity for shared attention, to increase the complexity of our reasoning about the world and to deepen our capacity for mutual understanding. See also Joint Attentional Scene. A system with behaviors, implemented as a human-performed game or a computer program or a combination of the two, that abstracts and imitates key components of an imaginary or real system, usually composed of multiple actors and complex causal relationships. Simulations are usually run multiple times to assess the effect of changing parameters. A Sign is a conventionalized physical form (signifier) that is recognized as referring to something other than itself (the signified) within a specific discourse community. A sign can be a symbol (like letters), an icon (like the stick figures differentiating male and female public toilets), or an index (like smoke is for fire). A form of patterned data, perceivable by machine or human, that is inscribed and transmitted in a medium, such as audio transmitted as a radio wave or letters transmitted by telegraph. In information theory, signals are corrupted by noise. A framework for understand human-machine interactions as conversations in which both parties are constantly assessing the state of the other. In the Situated Action model, the user’s knowledge of a process is not identical with a single step-wise decision tree or Plan, but inextricably tied to a much less predictable sequence of embodied actions. It is therefore the designer’s job to enhance communication, anticipating the user’s state, making the machine’s assumptions visible, and giving the user control over the sequence rather than expecting her behavior to conform to invariant scripts (Suchman 1987). See also Distributed Cognition. Used pejoratively in digital design contexts to refer to icons and other visual interface elements that reproduce the physical features of legacy artifacts without enhancing functionality. The bookcase-shaped “newstand” in the iOS interface is a well-known example. Inappropriate reproduction of legacy attributes are often a sign of early remediation-based design approaches. With the encyclopedic, participatory, and procedural properties, one of the four defining representational affordances of the digital medium. Digital environments can represent space using all the strategies of traditional media, such as maps, images, video tracking, and three-dimensional models. Unlike older media, however, and similarly to the experiential world and the designed spaces of landscapers, urban planners, and architects, digital media artifacts can be navigated. This affordance is not a function of visual representation, since it can be produced in text adventure games like Zork and Adventure, which created navigable spaces without any images. It is by-product of the procedural and participatory affordances, of setting up rules of interaction that have the consistency of navigating a fixed landscape, and of the innate human propensity to make sense of the world through spatial metaphors: we are predisposed to spatialized our experience, turning the appearance of text on our screen into the experience of “visiting’ web sites. Navigable space is created by clearly distinguishing one place from another and creating consistent interaction patterns that support movement between spaces. When encyclopedically large and detailed informational spaces or virtual worlds are well organized with clear boundaries, consistent navigation, and encyclopedic detailsthat reward exploration they create the experience of immersion. In computer-based environments, the state of a system at any moment is the set of current values of all the system variables. The concept of state is useful to the designer in understanding the range of possibilities for elements of a system (such as characters within a virtual world, documents within an archive) as well as for the system as a whole. A design tool consisting of a sequence of single images, like a comic strip, illustrating a temporal sequence, used in the pre-production phase of a film, animation, or interactive digital artifact. Storyboards are used as a strategy for thinking through design, and can be used early in the process, in conjunction with mockups to illustrate the interaction, or to illustrate a written use case. See also Iterative Design, Scenario, Wireframes. A document, like an HTML page or a podcast, composed of discrete parts labeled with metadata tags, which provide semantic segmentation similar to the fields in a database record. A large repository of similarly structured media files is a structured archive. See also Semantic Web. A way of generating variation within a fixed template, by identifying slots that can be filled by any one of a set of similar elements. Language is a grammatical substitution system, allowing us to substitute any noun or noun phrase as the subject of a sentence. Style sheets for web pages are substitution systems, establishing a fixed pattern for the display of variable content. Game avatars are constructed with substitution systems that allow players to interchange hair styles, facial features, body shapes, and clothing, creating elaborate variation within a fixed, easily extended framework. Substitution systems can be used as an information design and presentation strategy to establish genres that focus shared attention, and as a software design strategy to reduce the complexity of the programming task while expanding the interactor’s range of choice and experience of variety. In computer systems structured with a single central control program subroutines are subordinate programs that are passed information to do specific tasks and then return information and control to the master program. Creating subroutines is an example of modularity in programming. See also Function. Testing and data collection conducted after completion of a project to assess its performance. See also Formative Evaluation. One of the basic building blocks of information design, an extension of the list through spatialization and the basis for database design. See also Field, Grid, Record. Unconscious, unarticulated, situation-specific, knowledge that has been learned from experience through not explicitly. Tacit knowledge often forms a part of expert or veteran “know how,” and it can be hard to capture by novices or design interviews, since the knowledgeable person is not aware of drawing upon it. A descriptor used as metadata and attached to the whole or a part of a media object, such as a photograph or a heading in a web page as indexing, structural, or formatting terms. Indexing tags identify content, such as the place or date of a photograph. Formatting tags identify structural parts of a document , such as <heading> or display <italics> . A way of providing overview and access to an archive of media artifacts, such as online photo collections, by displaying metadata tags as an alphabetized array of tags whose size, color, or other visual characteristics indicates the quantity, popularity, recency, or other attribute of the tagged artifacts. Tag clouds can be automatically generated for expanding, unregulated collections user-generated tags, making them a popular interface strategy for folksonomy collections. A consistent, standardized classification schema for dividing a complex set of elements into hierarchically organized discrete categories and sub-categories. A taxonomy is an attempt to account for all the elements in a particular knowledge set (such as all living things) without ambiguity, and to provide category divisions that reflect expert knowledge of the field (such as cellular and non-cellular life). Media that are time-based, such as spoken language, audio and video recordings. Temporal media in digital formats can be more difficult to search and to present in overview than text documents or arrays of still images. Information organization strategies for temporal media include transcripts, descriptive metadata, playback control with fast forward and rewind, and excerpting. In general a thesaurus is a list of words and their synonyms. In information design, a thesaurus is a list of all the standardized descriptors in a controlled vocabulary, including guidance onthe correct word to use when more than one refer to the same thing (e.g. “residence,” “house,” or “home”?) and the relationships between terms, such as which broader terms are implicitly included in narrower ones (e.g. “sister” implicitly includes “sibling” which includes “family member”). A method for studying the responses of users to interactive artifacts, by asking them to articulate for the tester what they are thinking as they use the system. See also Iterative Design, Formative Evaluative, Usability. A form of information organization convention used in online bulletin boards and discussion groups and later adopted for email that collocates items with the same subject line, usually by stringing them together in order of the time of posting. Some systems recognize subtopics and create hierarchies of discussion threads. A two-dimensional visual organizing framework for the presentation of information chronologically, usually in a left to right horizontal configuration. Timelines are useful for displaying dated artifacts in an archive or for displaying a changing, quantifiable phenomenon over time (such as occurrences of a particular proper name in the news), but the encyclopedic capacity of digital environments can make it difficult to display all the relevant items in a single line, a problem that is sometimes solved by providing a zoom feature for the timeline. Timelines have also been widely used as interfaces for “multimedia” authoring environments, where they can sometimes reinforce unisequential structureand discourage interactivity. A segment of time within a computer simulation in which the state of the system is recalculated. Often in simulation games the action is explicitly paused while players make resource allocation. Time steps are also perceptible in the updating of counters or other displays in control panels of simulations, and in scientific simulations processes may be recorded and graphed by time step. An object in the real world, like a game controller, that has an effect in the virtual world, taking the interactor over the threshold from the real to the virtual, and increasing immersion by reinforcing belief in the virtual world (Murray 1997). A mechanical or digital switch that is either on or off and never neutral, such that activating it will always reverse its state. The capitalization lock on computer keyboards and the power buttons of many devices are a toggle switches. The bold anditalic buttons in word processors are virtual toggle switches. In mechanical devices and in virtual displays, toggles can be confusing if they do not offer clear feedback. One of the four models of interactivity discussed in Section V. A tool is a found or created object that fits in and extends the power of the human hand, whose value lies in its instrumentality, i.e. its usefulness in accomplishing a task. Design values for digital tools include direct manipulation, learnability, transparency, and expanded expression. See also Companion, Game, and Machine Models. Information that appears on rollover associated with an icon in an application program or game interface. With inscription and representation, one of the three components of a medium. Transmission is the transfer across space and/or time of a perceptible pattern based upon a socially agreed upon schema like the alphabet or Morse code. See also Convention, Format, Genre. Describes all exchanges of meaning between animals, people and/or machines, as the transmission of a message from point A where the sender encodes it, through a channel that maximizes signal and minimizes noise to point B where the signal is decoded by the receiver, into the original message (Shannon and Weaver 1963). Also called Information Theory, and often contrasted with Semiotic Theory. A word coined by the hypertext visionary Ted Nelson, and a key feature of his proposed Xanadu hypertext system, referring to the inclusion of one text within another while maintaining a single unique copy of the original, which remains under authorial control. In Nelson’s design, the author would be able to make changes to a single original and have those changes appear in all the compound documents in which it was transcluded (Nelson 2007). A desirable quality in a tool or interface, which is said to be transparent when it disappears from the awareness of the user, who focuses instead upon the task itself. A touch-typist experiences the keyboard as transparent; a confident driver experiences the automobile controls as transparent. Transparency is achieved by direct manipulation, continuous feedback, ease of use, and familiarity. Transparency is thwarted by cumbersome input procedures, hidden and interruptive processes, and a steep learning curve, all of which make the interface opaque, obscuring the task at hand. A hypothetical test suggested by cryptographer and mathematician Alan Turing in for distinguishing between a computer and a human being in a conversation held as an online text exchange. A more specific term than “linear” to describe media artifacts that are read, listened to, or viewed in a single authorized sequence, like the order of pages in a book or the temporal order of a film or podcast. Interactive documentaries and simulation games, by contrast, are multisequential, allowing the interactor to experience multiple coherent authorized sequences. A design goal that is closely related to specific empirical methods for creating and evaluating designs aimed at achieving the goal. Usability refers to the ease with which users of digital tools and informational resources can perform tasks. Usability methods emphasize empirical observation of users, explicit error messages, efficiency in task performance, lack of ambiguity, learnability, and formative evaluation through the measurement of task performance time, error rate, interface response time, and think-aloud protocols to capture frustrations and confusions in the user’s cognitive process. In a design document for a software application or other interactive artifact, a use case is a scenario describing a fictional but representative user, including the social context, goals, and steps the user would take in achieving the goals. The use case serves to focus design in the early stages of development and to explain the functionality to potential new users once the artifact is built. A common term for the human being who interacts with a digital artifact, which assumes a tool and task orientation, as compared with the player of a videogame or the more inclusive interactorwho may be playing or performing a task or perhaps following a multisequential story, or exploring a virtual world. A crucial element of formative evaluation and iterative design for interactive artifacts. See also Agency, Usability. Used in programming for the number or text in a container whose contents can change. Variables in programs have values, as do fields in databases, and attributes of elements in structured documents. Value lists are made for containers that have a fixed set of possible values (like provinces in Canada). A named unit of data specified in a computer program that can change its value during the execution of the code. Variables are “local” if they only can be read and modified by one part of a program and “global” if they can be read or modified by all parts of the program. The opposite of a variable is a constant, which has an unchanging value, such as the mathematical constant Pi. Digital images that are represented within a computer system as a set of instructions for drawing the geometrical components (e.g. polygons, lines, points) them rather than as a bitmap. A vector is a continuous rather than a fixed variable (a relative quantity rather than a specific number) so vector graphics can be resized without loss of information (the lines will always be drawn in the same relative proportions at the same angles no matter how long they are). The design value of making the processing of the computing machine clear to the interactor before, during, and after it takes place. See also transparency. A simple program or applet that can be plugged into a common platform, like a web widget into an HTML page, and often into a proprietary platform like the Apple Dashboard. Widgets are generally limited in function and easy to plug in or delete from the host environment. Acronym for the common desktop graphical user interface (GUI), standing for Windows, Icons, Menus, Pointers. A schematic drawing of an interface, indicating the size and shape of key areas and the functionality of interactive elements, but lacking the actual graphic and textual content. Web wireframes are usually based on a grid and can be used to establish a style sheet or template to ensure uniformity in a multi-page site. Wireframes can also be used as a focus of design team discussion and as the basis of paper-based user-testing, in order to concretize thinking about interaction early in the design process. An acronym for ‘What You See Is What You Get” pronounced “wiz-ee-wig.“ WYSIWYG interfaces replaced markup interfaces for word processing in the 1980’s Previously word processor required the use of codes similar to HTML, so that an italicized word would have to be coded as <i>Hello! </i> instead of appearing on the screen as Hello! — just as it would in print. WYSIWYG interfaces in general are desirable because they allow for direct manipulation. XML stands for Extensible Markup Language, a proposed successor to HTML developed by the W3C under the direction of Tim Berners-Lee as part of their effort to create a Semantic Web which would be better organized forinformation sharing andknowledge creation than the current World Wide Web. XML is a meta-language, a format for creating metadata sets that form the basis of structured documents.